New York: Roy Publishers, 1960. 1st. Cloth. Collectible; Fine/Very Good. 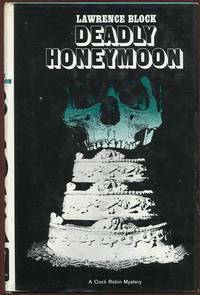 The 1960 1st edition. Solid and Near Fine in a bright, price-intact, VG dustjacket, with just a touch of wear at the spine ends and light soiling to the rear panel. 12mo, 176 pgs. "A new slant on an age-old racket! 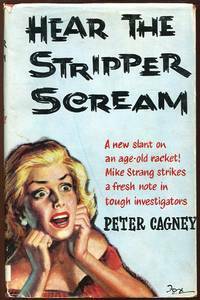 Mike Strang strikes a fresh note in tough investigators" (from the front cover). New York: Macmillan, 1967. 1st. Hardcover. Collectible; Very Good/Very Good. A solid copy of the 1967 stated 1st printing. Tight and VG (with light wear at the rear panel's top-edge) in a bright, price-intact, VG+ to Near Fine dustjacket. Octavo, 189 pgs. New York: A.L. Burt Company, 1926. Cloth. Collectible; Very Good/Fine. A handsome copy of the 1926 re-issue by A.L. Burt. Solid and VG+ (with light fading to the spine) in a crisp, Near Fine example of the wonderful pictorial dustjacket. 12mo, 321 pgs. plus publisher's ads. New York: David McKay Co, 1947. 1st. Cloth. Collectible; Fine/Very Good. The 1947 1st edition. Solid and Near Fine in a bright, price-intact, VG- dustjacket, with several closed tears along the panel edges and light chipping at the spine crown. Octavo, 218 pgs., an "Armchair Mystery"
New York: Alfred A. Knopf, 1946. Decorative Cloth. Collectible; Very Good. 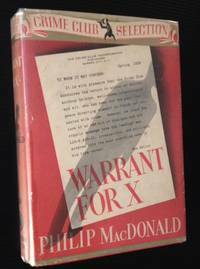 The Feb. 1946 2nd printing of the "Black Widow Thriller" edition. Solid and VG in its light-blue cloth, with decorative blindstamping at the front panel. Very light spotting along the front board, otherwise very clean. 12mo, 277 pgs. Chicago: Newsstand Library Incorporated, 1960. 1st. Original Wraps. Collectible; Fine. A clean, very solid copy of the 1960 1st edition. Crisp, bright and Near Fine, with one microscopic chip at the spine. Pocketbook NSL U137. "The chase was furious--the capture was rapacious--the prize was luscious!" New York: G.P. Putnam's Sons, 1924. Cloth. Collectible; Fine/Very Good. The September 1924 4th printing, IN THE UNCOMMON PICTORIAL DUSTJACKET. Clean and Near Fine in a bright, VG dustjacket, with light chipping --and several small closed tears-- along the panel edges. Thick 12mo, 334 pgs. New York: W.J. Watt & Co, 1921. 1st. Cloth. Collectible; Very Good/Very Good. The 1921 1st edition, IN THE UNCOMMON PICTORIAL DUSTJACKET. Solid and VG+ (with light offsetting at the gutters) in a bright, price-intact, VG example of the George Gage-illustrated dustjacket, with light soiling at the rear panel and spine and very light chiiping to the top-edges. 12mo, 281 pgs. Set principally in London but with a dash of Turkish intrigue. New York: Pocket Books, Inc, 1949. Original Wraps. Collectible; Fine. NICELY INSCRIBED BY PATRICK QUENTIN (AND SIGNED ADDITIONALLY AS HIS ALIAS "RICHARD WEBB") on the verso of the title page. 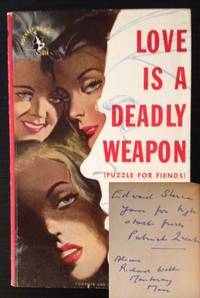 A beautiful copy to boot of the 1949 1st paperback edition, which was originally published in hardback by Simon and Schuster in 1946 as "Puzzle for Fiends". Bright and crisp and Near Fine in its wonderful pictorial wrappers. "One of the three women in his life had a plan for murder....his murder!" Signed by Author. New York: Robert M. McBride & Company, 1931. Cloth. Collectible; Very Good/Very Good. The 1931 second printing before publication of this wild "football mystery". Solid and VG in a bright, price-intact ($2.00) example of the wonderful pictorial dustjacket. Light wear at the spine ends, otherwise very sharp. 12mo, 265 pgs. New York: A.L. Burt Company, 1921. Cloth. Collectible; Very Good/Very Good. The 1921 A.L. Burt reprint. Solid and VG+ in a bright, VG- example of the wonderful pictorial dustjacket, with 1 1/2" of loss at the spine crown and several small closed tears along the panel edges. Still though, very presentable. 12mo, 294 pgs. Garden City, NY: Doubleday, Doran & Co. (The Crime Club, Inc.), 1938. 1st. Cloth. Collectible; Very Good/Very Good. A very solid copy of the 1938 stated 1st edition. Tight and VG in a bright, price-clipped, VG dustjacket, with light fading along the spine and very light soiling to the rear panel. Octavo, 319 pgs. Garden City, NY: Doubleday, Doran & Co, 1923. 1st. Decorative Cloth. Collectible; Very Good. The 1923 1st edition. VG- in its pictorial cloth, with light rubbing at the panelsand mild darkening at the spine and chipping along the spine label. Internally, very clean, with no writing or markings of any kind. Octavo, 333 pgs. New York: Dodd, Mead and Co, 1912. 1st. Cloth. Collectible; Very Good/Very Good. The 1912 1st edition, IN THE UNCOMMON PICTORIAL DUSTJACKET. Solid and VG+ in a bright, VG dustjacket, with light wear at the spine and rear panel edges. 12mo, 337 pgs. A crisp example of the dramatic 1912 dustjacket. New York: The McClure Company, 1908. Decorative Cloth. Collectible; Very Good. 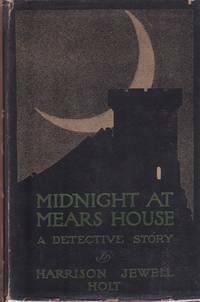 The 1908 1st American edition. VG in its dark cloth, with bright gilt-lettering at the front panel and lightly-faded lettering at the spine. Former owner inscription to the title page, light soiling at the front free endpaper and front pastedown, otherwise very clean. 12mo, 276 pgs. Futuropolis, 1980. Cloth. Collectible; Fine/Fine. The 1980 1st French edition of a number of the serialized late 1930s Charlie Chan stories. Translated from the original Earl Derr Biggers text. Clean and Near Fine in a bright, Near Fine pictorial dustjacket. Quarto, panelled comic strips, which include the wonderful original Alfred Andriola illustrations.